A first-of-its-kind Bond video game, 007 Legends features an original, overarching storyline inspired by six classic Bond movies, combined with the heart-pounding action gamers have come to expect from their next-gen platforms. 007 Legends is the most diverse Bond gaming experience ever created. Gamers and Bond aficionados alike will become James Bond, reliving the world-famous spy’s most iconic and intense undercover missions from throughout the entire Bond film franchise - including this year’s highly anticipated new installment, "SKYFALL." Players use their Bond knowledge and quick wit to test their mettle - employing Bond’s full arsenal of gadgets and weaponry, to face notorious villains and their brutal henchmen, perform impressive stunts, and of course, mingle with gorgeous Bond women. 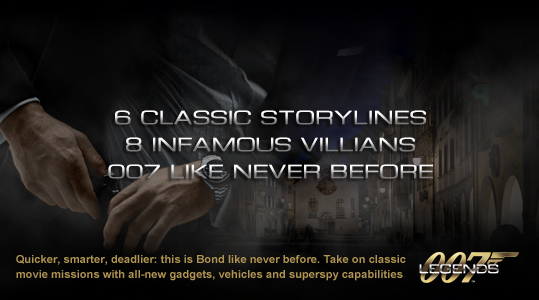 Currently the website hosts a trailer announcing the six month promotional lead up to the release of 007 Legends. Head to 007Legends.com to pre-register online to recieve insider intel on new prizes, games, online experiences and exclusive downloads. This is the fourth James Bond 007 video game to come from Activision since they took over the licence in 2006. Their games to date include: a merge of plotlines from "Casino Royale" and "Quantum of Solace", released in 2008 to coincide with the second Daniel Craig adventure; GoldenEye 007 for the Wii, released in conjunction with the original adventure, Blood Stone; and GoldenEye: Reloaded, a ground up rebuild of their GoldenEye engine for the next-gen consoles. Activision latest game, 007 Legends, is slated for release on October 16, 2012.